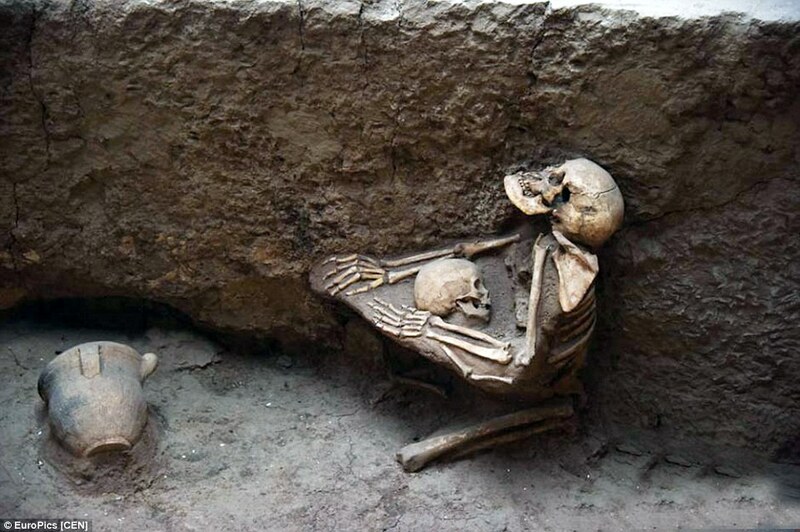 The loving embrace of a mother and child has lasted 4000 years old, as Chinese archaeologists discovered when they found their interlocked skeletons. The remains were dug up on an early Bronze Age archaeological site branded the ‘Pompeii of the East’, the People’s Daily Online reported. Experts believe the site was hit by an earthquake and flooding of the Yellow River, but are yet to understand the exact scale of the disaster. However, the catastrophe is thought to have wiped out the entire settlements, leading to comparisons with Pompeii – although the site, known as Lajia – is more than 2000 years older than the ancient Roman city. Photographs of the skeletal remain’s show the mother looking up above as she kneels on the floor, with her arms around her young baby. Archaeologist’s say they believe her child was a boy. Another pair of skeletons were also discovered locked in an embrace at the same site, this time lying down on the floor. A number of other remains have also been found huddled together. The incredibly well preserved site paints a tragic picture of people trying to their families in the midst of a terrifying earthquake. The Lajia site is the biggest disaster excavation site in China at nearly 40,000 square feet and was 1st discovered in the early 2000s. The excavation site is of particular historical importance because it holds clues to an early Bronze Age civilisation that lived in the upper Yellow River region. The team of archaeologist’s presented their findings at an academic conference in Gansu province, northwest China, earlier this month. The skeletons are now on display at the Lajia Ruins Museum.